As Modern Family ages and relies more and more on comedic situations where, quite frankly, the characters aren’t particularly good to each other, or are sometimes outright irritating, patience with the show and one’s enjoyment of it will vary from person to person. This week’s episode, returning after just a short break over the holidays, is likely one of those episodes that hit the right mark for some, and was downright obnoxious to others. Every single storyline from “He Said, She Shed” involves less-than-ideal character qualities: Luke lies in order to selfishly sabotage his mother, Jay puts a ton of pressure on Joe to succeed while also cutting down Manny, and Mitchell and Cam’s relationship continues to be a weird game of who can prove which one is more manipulative. They really do revel in each other’s misery. For my money, “He Said, She Shed” finds just about the right balance. There are far too many easy jokes, and once again Jay comes across like one of the worst father’s on television—at least when limited to sitcoms—but the way the episode is structured allows for a fair amount of laughs. When you move past the premise of each story and get to the joke delivery and the physicality of the actors, “He Said, She Shed” ends up hitting the mark more often than not. But let’s get back to Jay for a second because he’s been a consistent problem this season. He’s always been a crotchety old man, but underneath all of that used to be something softer, something more noble in a old school kind of way. Jay is the embodiment of traditional masculinity, and while that comes with its fair share of jokes that make his younger kids roll their eyes in disgust, it also gave him his sense of putting family first. He’s always been about doing things for this family, especially in his old age, and yet now he’s seemingly perfectly happy to either kick his feet up and drink scotch to avoid his responsibilities, or he’s actively hurting the people around him. It’s been strange to watch. Just a few weeks back Jay couldn’t stop harassing Terry Bradshaw during jury duty. It was harmless in the grand scheme of things, but also didn’t feel like Jay. The pattern continues to develop, and now Jay, who finally finds something to share with Joe when he discovers he’s an incredible golfer, sabotages the moment. He pressures Joe until the kid is screaming into his golf bag and threatening to step on the fingers of other kids. Is Jay so far gone, so disappointed in Manny and far removed from his older kids, that he can’t see what he’s doing? Jay’s actions feel like a contrived way to create conflict more than anything, and it poisons the entire story. Elsewhere though, “He Said, She Shed” is funny enough to distract from the fact that Luke, older and yet still the same amount of stupid, purposely hurts his mother, and that Cam and Mitchell’s relationship may not be the healthiest. Look, I know you can’t always apply a lens of reality to these stories; it’s a sitcom, and that necessitates and certain amount of exaggerated conflict and harmful behavior. But when it’s one episode after the next, as it has been this season, it’s difficult to ignore. Still, I won’t get into the fact that Luke is the worst, because Ty Burrell and Julie Bowen carry their scenes with their physicality. They do a wonderful job of using their bodies and faces to elevate the otherwise predictable comedic beats. The best moment is when Claire finds out, during a meeting with the Homeowner’s Board, that Luke, and an unknowing Phil, forged the rejection letter from the board denying her “She Shed,” a private space she was looking to build in the backyard so that she could have somewhere to unwind. Phil, confronted with this moment, simply turns and runs as fast as he can. It’s a great physical beat, and the story is filled with them, from Phil getting trapped in the batting cage net to Claire taking out her rage in the agreed-upon batting cage near the end of the episode. Bowen and Burrell make the more predictable into something enjoyable. Something similar happens with Cam and Mitchell. When Cam finds out that his father once left his mother and lived with a diner waitress for a year—he was told his father was at war—he cracks, and right before Lily’s party with all of her friends. 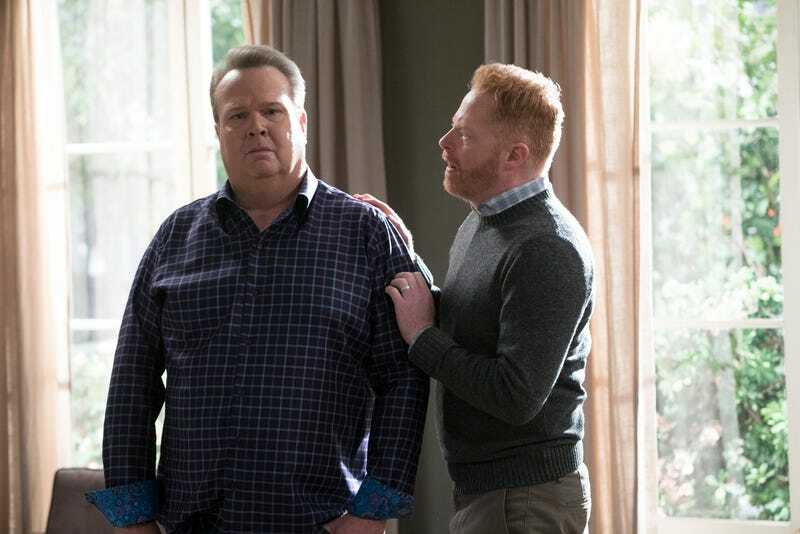 Again, the setup and the premise isn’t necessarily all that compelling, but both Eric Stonestreet and Jesse Tyler Ferguson find a way to make the jokes land with their physicality. Stonestreet in particular is great at selling Cam’s rapid descent into emotional chaos, dropping harsh lines about his father to Lily’s friends before swinging through every emotion possible when visiting with Mitchell’s therapist. Ferguson shines too, playing his counterpart that’s trying to hold it together and be supportive, only to then lash out when Cam seems to get past his issues while Mitchell has spent ten years trying to work through his own. Good comedic dance partners can make all the difference, and that’s exactly why “He Said, She Shed” is able to rise above its mostly predictable situations. Much like Jay, apparently the only storyline Alex is going to get this year is that everybody finds her annoying.